NB: Val Biro passed away last month, at the age of 92 (Guardian obituary here). I've written about Val and his terrific dust jacket designs a number of times on Existential Ennui – follow this link to previous posts, or take a look at the examples of his dust wrapper work on this page – and last year had the opportunity to interview him in person about that work. The resulting article, an edited version of which appears below, was initially intended for Illustrators Quarterly, who in the wake of Val's passing will instead be running a more substantial feature on Val's life and art (drawing in part on my interview) to appear late this year/early next year. In the meantime, Illustrators have graciously given me the go-ahead to publish my original piece, which I present as my personal tribute to Val and his work, illustrated with wrappers and roughs from my own collection. If you spend any amount of time browsing the hardback fiction shelves in secondhand bookshops – as I do, whenever I get the opportunity (and probably more than is entirely healthy) – chances are you'll have unwittingly encountered the work of Val Biro. Not as an author: for that aspect of Val's career you'd be better off heading to the children's section, where you'll doubtless find a selection of the 37 picture books he wrote and drew from 1966 to 2001, all starring Gumdrop, a vintage 1926 Austin 12/4 motorcar. No, the Biro work you'll see in the fiction department is of a different stripe. It was created both prior to and parallel with his children's titles, and the books it was made for number in their thousands. From the early 1940s until the late 1970s Val Biro designed an estimated 3,000 dust jackets – more than any other jacket designer of the era. 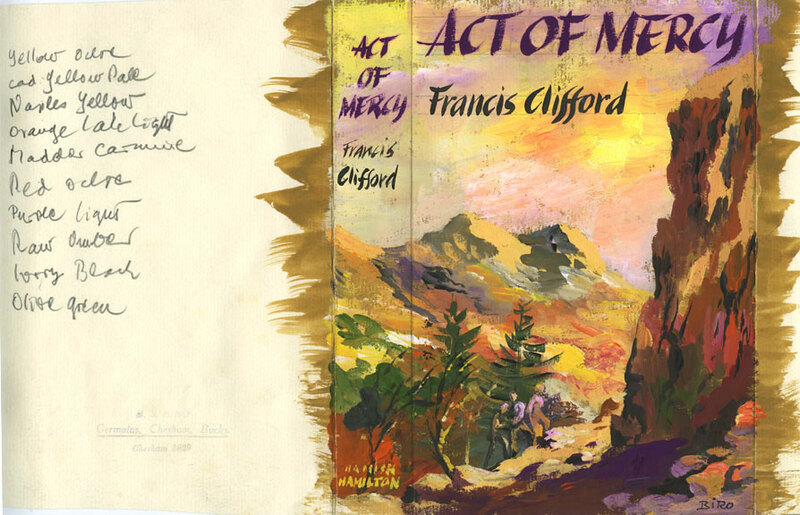 His artwork wrapped books by C. S. Forester and Sir Arthur Conan Doyle; Nevil Shute and James Hadley Chase; Iris Murdoch and Geoffrey Household – from crime thrillers to romance, literature to non-fiction, and for every major publisher. It's a remarkable body of work, encompassing not only the finished jackets but the preparatory roughs too – sometimes multiple roughs for a single wrapper – the vast majority with hand lettering painted directly onto the artwork. 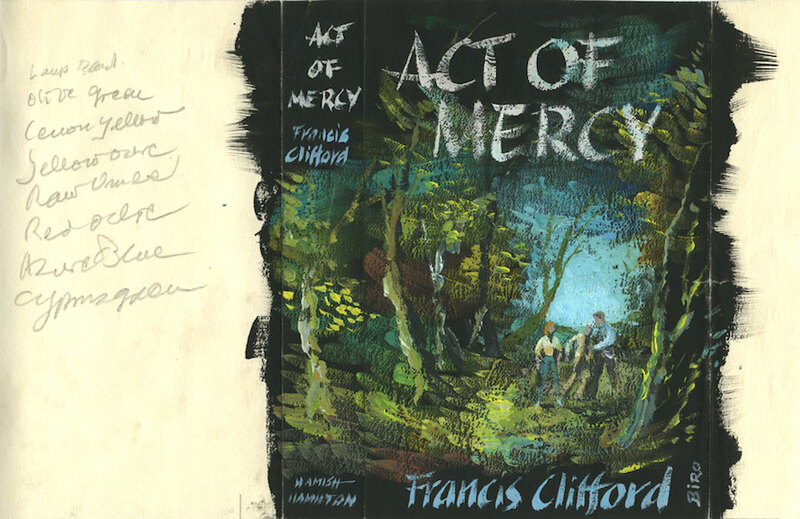 His covers are instantly recognisable: a striking central image – evoking the feel of the novel overall rather than a particular scene – done in dry brush (gouache), often restricted to just two or three colours, i.e. three-colour line, "which in those days was quite popular because it was cheap to reproduce", as Val himself explained to me when I pinned him down for a chat at a book fair he was a guest at. He created his first wrapper as a freelance designer in 1942, for the Collins edition of Rex Stout's The Broken Vase (for which he was paid five guineas); at that time he was also employed as an assistant at Sylvan Press – illustrating interiors and covers – having spent three years at the Central School of Art after emigrating to the UK from Hungary in 1939. But by 1953, after a stint with John Lehmann Limited, Val was ready to take the plunge and go fully freelance. In common with other jacket designers of the era, Val was rarely given a brief; instead he would read each novel he was designing the cover for, a practice virtually unheard of these days. "It would be: here's a manuscript, come up with a good design," he recalls. "They'd tell me whether it's full colour, or three-colour line, and the size. Then I'd do the roughs, which I put a lot of work into. Occasionally I would do two or even three roughs to give them a choice. I worked hard in those days!" "I remember, Mr. Walter Hutchinson himself, the eponymous publisher, he insisted on seeing a rough but it had to be twice up, full colour, everything. I was told he usually received the art editor in bed – well, he was in bed, because he liked the late mornings. The art editor would come in and say, Mr. Hutchinson, this is the cover for so-and-so, and give it to him. If he didn't like it, he would get out an indelible blue pencil, and with a 'no', put a line through it, ruining the picture." Thankfully the pencil-wielding Mr. Hutchinson was in the minority; other publishers and art editors weren't quite so physical with their criticisms, and many of Val's roughs survive today. Indeed, Val has fond memories of most of the publishers he worked for, whether it be Michael Joseph, who commissioned him to design the wrappers for the first half-dozen Hornblower novels by C. S. Forester, or Hodder & Stoughton, who not only sent plenty of dust jacket work his way but also, from the 1960s on, published his own Gumdrop books (under their Brockhampton Press children's imprint). 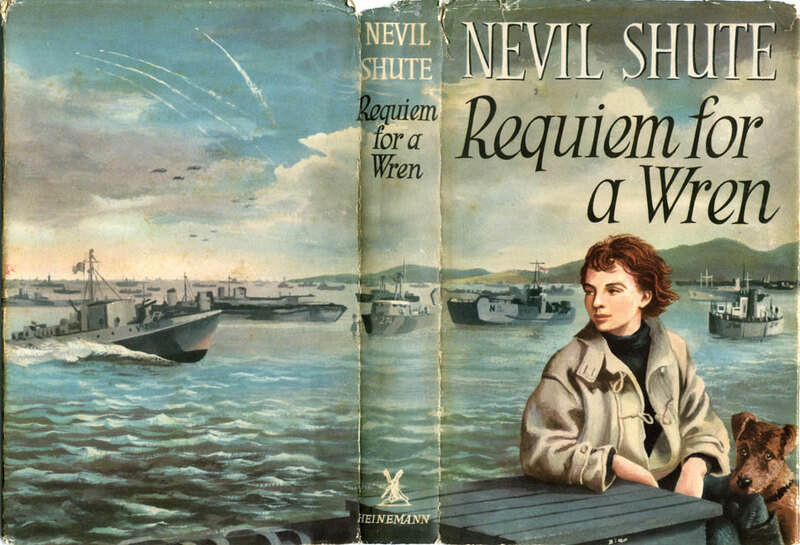 And admirers of his work didn't just number publishers and art directors; Nevil Shute, for whose novels Val designed the wrappers for In the Wet (1953), Requiem for a Wren (1955) and others, was certainly impressed by what he saw. "We received a letter from Mr. Shute from Australia," Val recalls with pride. "He said to the publisher, 'Thank you for employing an artist who evidently knows Australia well.' I'd never been there in my life!" Val was just one among a multitude of book jacket designers beavering away in the '40s, '50s and '60s, all offering their own take on the restricted palette style – largely unsung artists like Donald Green, Peter Probyn, John Rowland, Roy Sanford and sisters Barbara and Eileen Walton (not to mention the rather better appreciated likes of Denis McLoughlin and Brian Wildsmith). Of his contemporaries, Val singles out Hans Tisdall, perhaps best known these days as a painter but back then also a book designer (his most famous wrapper probably being for Lampedusa's The Leopard) "who worked in a style not unlike the three-colour line which was typical of me in those days. I never met him but I admired his work. To an extent my lettering is influenced by him." A greater influence came courtesy of Val's time at Central School. 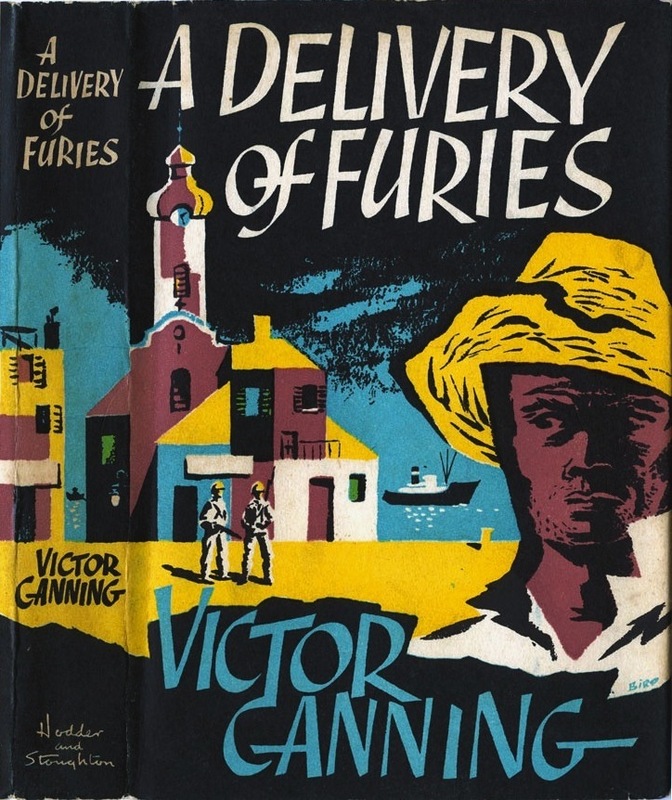 A number of Val's wrappers are reminiscent of woodcut prints – his jacket for Victor Canning's 1961 novel A Delivery of Furies, say – which, it turns out, was no accident: "I started as a wood engraver. At art college my tutor was John Farleigh – great name in his day. I did some, I think, very good engravings under his influence. But when I came to book jackets I realised that the timescale – I usually would get about a couple of weeks at most from rough to finish – was very tight. An engraving would take me about a fortnight to do!" Towards the end of the 1970s Val's time as a jacket designer "as a main activity" drew to a close. "I became so involved in children's books and my own Gumdrops that I didn't have time or, actually, the interest. The problem with a jacket is, it's basically the same, isn't it?" he muses. "To encapsulate a whole book in one design. Which is interesting. But there came a time when I was much more interested in writing my own stories and developing my own books." Working methods in jacket design had changed too – the introduction of Letraset and greater use of separations and superimposing – and this was also a factor in Val's decision to move on to other endeavours. While he, of course, as a professional, adapted to these changes, he much preferred his original way of working, "because it was very much integrated – I mean the design and the lettering was all one piece, whereas if you superimpose it it's not quite the same thing." As for more contemporary dust jacket design, it must be said that he's not overly keen: "A lot of it is computer-generated... I can't see today the individual hand, the person who's done it. It's often done in-house rather than by a freelancer, some of it by computer, and the concept is usually the concept of a committee rather than a single mind." Instead, Val has continued to carve out a place in publishing history as an in-demand children's book author and illustrator. Now in his nineties, his most recent project has been a series of 200-page fully illustrated hardbacks for Award Publications, retellings of Aesop's Fables and Grimm's/Hans Christian Andersen's/Charles Perrault's Fairy Tales; the latest volume, based on the Arabian Nights, was in-progress when we spoke, but Val expects that "will probably be my last book because I can't imagine taking on a big commission like that again, at 91." Even without all of his children's titles, his astonishing body of dust jacket work must surely stand as one of the greatest achievements in book design – 3,000 covers in less than 40 years. An incredible amount of work, agrees Val, but his only explanation for this prodigious output is as matter-of-fact as one would expect of this softly spoken, unassuming man: "I was probably the busiest jacket designer at that time in the country." 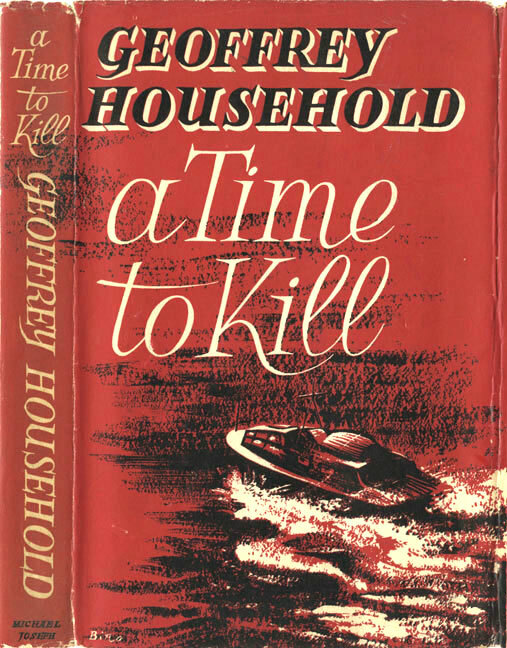 Geoffrey Household, A Time to Kill (Michael Joseph, 1952, sequel to A Rough Shoot): "This is two-colour line, dark red and black – the white is the paper – so it's two colours. This could be reproduced on line blocks without a screen, and therefore not art paper but ordinary cartridge. Very effective." 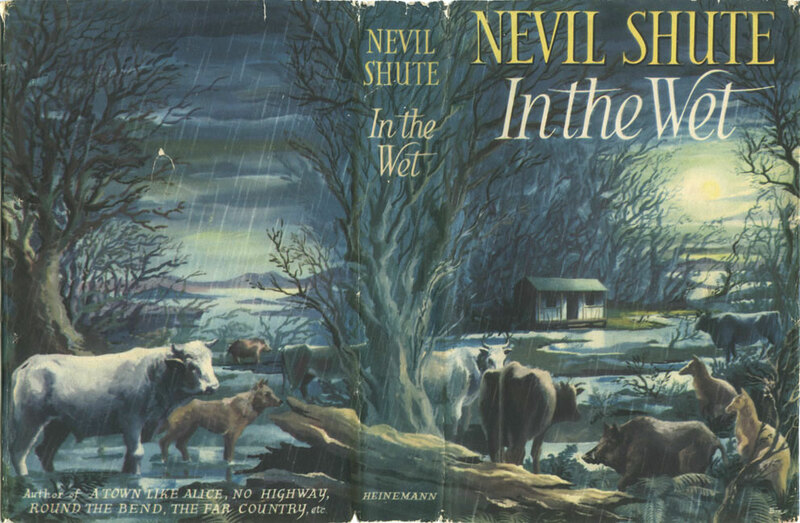 Nevil Shute, In the Wet (Heinemann, 1953): "This isn't based on a particular scene but on the feel of the flooded landscape." 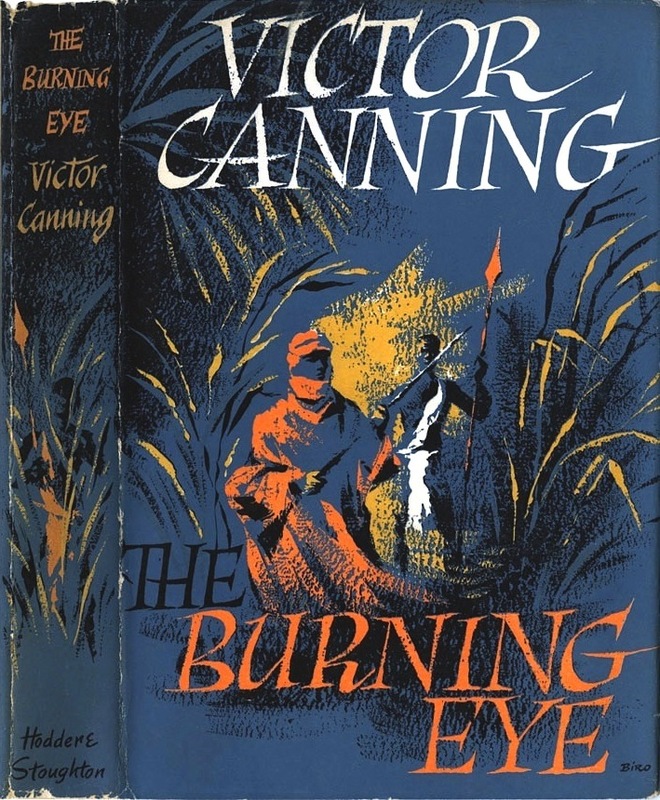 Victor Canning, The Burning Eye (Hodder & Stoughton, 1960): "I used dry brush because it had to be reproduced by line rather than halftone. You had to be careful that you worked in such a way that it reproduced well." 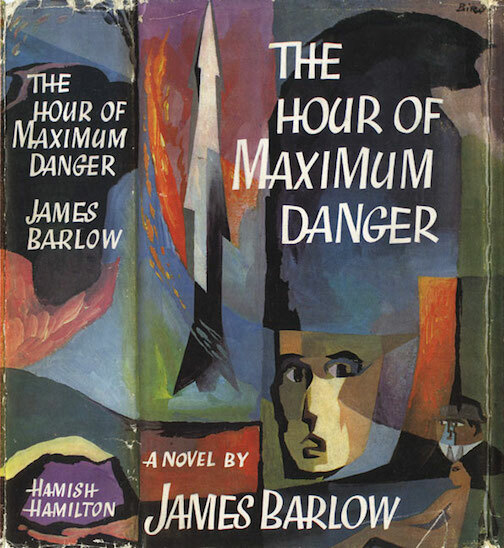 James Barlow, The Hour of Maximum Danger (Hamish Hamilton, 1962): "An artist keeps his eyes open to what's happening in the art world, and I was quite taken by this kind of abstraction. But after the abstract era I left the conceptualists and so on totally aside because that's not me at all." Those jackets (and that output) are stunning. I'm going to track down these fully-illustrated children's books. Both of my daughters are approaching the age to enjoy them, as well, so it's a whole-family win. What an excellent piece on Val Biro. I came across his work gracing the covers of books by Rupert Croft-Cooke and Peter de Polnay, and many others. Many thanks. Thanks for the kind words, both. I'm glad I got to talk to Val before he passed away; I only met him a couple of times, but he was a lovely guy as well as a fine artist.